SleepEssence combines lavender, vetiver, valerian, and Ruta graveolens essential oils with the hormone melatonin (a well-known sleep aid). SleepEssence is a natural way to enable a full night’s rest. The softgel vegetarian capsule allows easy ingestion. 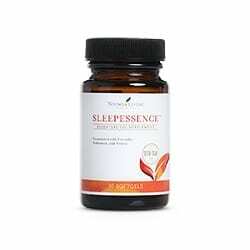 SleepEssence contains four powerful Young Living Therapeutic Grade™ essential oils. These oils have unique sleep-enhancing properties. They are in a softgel vegetarian capsule for easy ingestion. Combining lavender, vetiver, valerian, and Ruta graveolens essential oils. Included with the hormone melatonin, a well-known sleep aid. SleepEssence is a natural way to enable a full night’s rest. Caution: Do not operate heavy machinery for 8-10 hours after using. Not recommended for long-term use or with products containing echinacea. Adult use only. Keep out of reach of children. If you are pregnant, nursing, taking medication, or have a medical condition, consult a healthcare practitioner prior to use.